Finally there is a neat and lightweight Tail Bag available for both the M5 Carbon High Racer and the M5 M-Racer. The only additional part you need for assembly is the already available carbon carrier/fender. The Tail Bag attaches to the carrier/fender with a simple Velcro system. The lid is also put into place with this material. Of course there is a possibility to add some kind of lock system as well. The product is currently made with a wet lay-up system but will probably change to a pre-preg technique. This saves time and weight. The weight is now close to 800 gram, which is definitely low weight, but with the pre-preg method it will drop to a mere 500 gram. And last but not least: because of the perfect fit to the rider this Tail Bag reduces the heart rate with around 10%. Or consider the gain with the same heart rate: speed will increase with km/h (1,3 mile/h) when cruising with 40 km/h (25 mile/h)! Takes quite a lot of extra training to equal these numbers! 20 inch aero rims available in carbon 3K ! 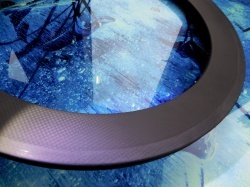 Available now: 20 inch aero rims in carbon 3K with a rim height of 50 mm ( almost 2 inch!). These rims come as a spin-off from another project we are busy with. 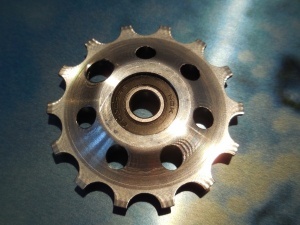 Available with spoke hole nrs. of 16, 20 or 24. Rim width of the 406 model is 25 mm. The 451 rim has a width of 21 mm. Weight is only 306 gram (+/- 5 gram). Allowed tire pressure is 8.5 bar (120 PSI). It's on Bram's CHR right now and time will tell if this system will be a keeper. For me it's not completely new, since I already tried a similar setup 28 years ago. However, then it was made of steel and was removed again due to the annoying noise it produced. If the findings with this aluminium version lead to a positive assessment, the sprockets will be colour anodised and coated with a rock hard Teflon top layer. We'll keep you posted on future developments! Who spots this unique bike? Unique handbuild carbon recumbent, based on Shock Proof 20/20 has been stolen September 30 from the garage of Bram Moens. Features: high 18 spoke 20 inch aerorims, dark blue metallic paint, M5 sidepull brakes, carbon triple crankset, titanium stem, carbon luggage carrier, Rock Shox rear suspension, fixed bracket, mono suspended front fork, EBS thumb handles, Speedplay titanium Frog pedals. Please let us know if this bike shows up somewhere! Send us an e-mail at info@m5-ligfietsen.nl or contact us on number +31 118 628759 or +31 6 1403 7797. Thanks! Finally a mirror that's compact, thus inconspicuous, without vibrating bracket and with good looks: the Zephal Spin. thoroughly tested during the Viking Tour and this is a stayer! 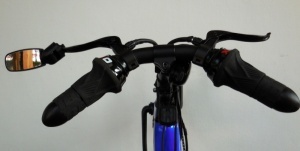 Naturally with some modifications, but this way it can be mounted directly on the brake lever. Also looking forward to an extended weekend of bicycling? Our top randonneur Arthur van der Lee took two days extra time off to start Borders of Belgium. Well, if you have an efficient bike these tours are covered almost effortless. However, it's not really about setting the fastest time, but more the adventure along the way. You'll always experience something special. Good video-impression by a Viking Tour 2014 participant on a road bike. Well cut footage of the mountains, the views, tunnels, descents and ascends. At 52 seconds a glimpse of an M5-Team member! 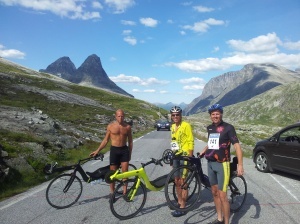 "I think it goes faster"
Cool down after finish: Herke Wendt, the fastest of the Viking Tour860 km, 11500 metres of ascending, five fjords, nine mountains, this is the setting of the beautiful, but tough route of the Viking Tour. Over 140 participants, young and old, among them four recumbent riders on their M5 Carbon High Racers. (the fifth, Robert Carlier, unfortunately couldn't participate for personal reasons). The weather was untypical for Norway: loads of sun and temperatures above thirty degrees centigrade. Only during the final stage dark clouds and thunderstorms dominated during part of the day. The positive attitude of the other participants with respect to the recumbents was striking. Lots of attention and admiration that we had the courage to go into the mountains... After the first few stages a road biker concluded: I think it goes faster. When Herke Wendt (40) had won two stages, astonishment really kicked in. What's happening here!?. But after the success of the recumbent still no sign of any envy, victory was fully acknowledged. Herke, in fact the "true Viking" due to the lack of a shirt, was mentioned separately during the award ceremony as the most rapid. Cheering seemed a little louder when his name was called. Around the parked M5 Carbon High Racers bystanders where often checking out the technique and all kinds of questions were asked at the M5 Team. Some even took a test ride. The M5 Team participated along a field of participants in which also a strong group of professionals took part. The leading group rode en climbed fast every day. Still Herke established the highest average stage speed twice with his M5 Carbon High Racer, 35.9 en 36.9 km/h. Both times in mountain stages with finish on top of the mountain. The whole M5-team passed the finish without technical malfunctions. This is given the circumstances not completely obvious. The road of the prologue was in such bad condition that you were almost thrown off your bike. Kind of ascending in a river bed. Wheels coming loose from the underground due to pot holes and grooves. In later legs the bikes also took heavy impacts. Speeding through gravel on 8 bar racing tyres seems a request for flats and for wrecked rims. En what about climbing: full power on the pedals, chain as tense as a string, 12 percent, 14 percent, every revolution maximal stress on the propulsion system. Subsequently down again: kilometres of intermittent braking, expecting the rim to get red hot. But at the end of the stage only the rider is wrecked: the bike is only dusty and ready to make a new start next day. En route road bikers could be seen struggling with their usual discomforts. But then, they have to, because "climbing on a recumbent is impossible"... 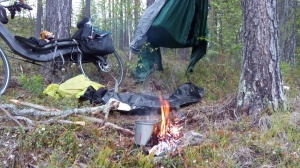 In the past it has been demonstrated often then ascending on a light recumbent is fine, but thanks to Herke Wendt it has been emphasized again. Winning a stage twice with ample lead to well trained athletes shows that climbing is just no problem. And the superiority of the recumbent on flat terrain and during descends was already no longer a subject for debate. Ascending, preferably with a few percent slope on nice tarmac, is simply spectacular: the bike remains incredibly stable, everything feels save, under control. Carefree enjoyment on the M5 CHR's while racing down a mountain. Where road bikes ascended with 70 km/h, the recumbents went (while free-wheeling) 30 percent faster here, in this case up to 94 km/h. The Viking Tour was an endurance test for the participating M5's and their riders. Obviously, Herke was the undisputed star. In the classifications Bram was on average at a third from the top and in the top 5 of his age category. Despite his lack of training kilometres Wout was close to Bram. Daniel not only finished the whole tour, but also managed to leave about 50 of the 150 participants behind. 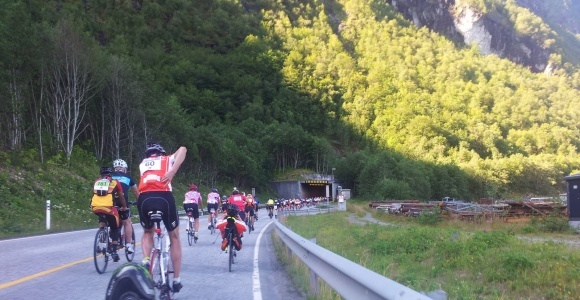 Friday July 25 was the final leg of 158 km in the Viking Tour from fjord village Stryn to mountain place Vagamo. This stretch had 1850 metres of ascending. Biggest part of these was the ascent to the Gamle Strynsvegen, going up from sea level to 1150 metres. After my more or less mandatory two day rest due to intestinal problems, I really wanted to participate in the final stage. A beautiful route through one of my favourite mountain areas, in which I also painted a lot. The morning start in Stryn coincided with the arrival of a massive thunderstorm, only to be outrun by riding really fast. That was my plan anyway, since I wanted to build up as much distance between me and the pursuing group, because of the long climb that would follow later. With twofold stage winner en M5 team member Herke Wendt behind me we speeded with 50 km/h to the mountains. Cooling was through large showers: I enjoyed them after all these 30-plus centigrade days!! Result of our fast take-off was that the much younger and stronger athletes didn't pass us until we were at 700 metres. The overtaking speed was clearly lower than at the beginning of the Viking Tour. Just imagine: younger (say 30 years), stronger (400 Watt in stead of 295 Watt) en lighter riders on M5 Carbon High Racers... Any difference would simply be eliminated!! On top of the mountain plateau a 23 km flat to 1 to 2% descending dirt road followed, featured with large potholes. And yes, in one of these I encountered a somewhat too sharp edge at 50 km/h which even my 9 bar rear tyre could not withstand. Repairing the snakebite took me 12 minutes and I had to continue with just 5 bar of pressure due to the limitations of the small hand pump. Moments later another pothole made my cellphone go airborne. The search for the four pieces of phone took me another 3 minutes. The 70 km hidden gradient/flat route plus 200 metre bump from Grotli to Vagamo was recumbent heaven and occasionally guaranteed high top speeds. At the end of the stage we were presented a climb of another 5 kilometres with gradients up to 14%. Eventually I finished with five hours of cycling at place 28 of 141 participants, of which 95% being younger than I. By the way, also this five hour ride was covered fully solo. However, why do we do all this?? Climbing while using a lightweight recumbent: theoretically no different from a comparable road bike, but now also in practice: forty year old landscaper demonstrates with two victories on an M5 CHR it is indeed possible. In short: if a bike like the M5 Carbon High Racer survives all the challenges at the highest level of the Viking Tour with National Norwegian Triathlon Team members amongst them you can be sure that it will also meet all your requirements during commuting, bicycle holidays or long tours. Herke does it again: after winning the 3th leg he now also wins the 6th leg of the Vikingtour!! Herke Wendt again overall winner, this time of the 6th leg of the Viking Tour. After ascending for approximately 600 meters Herke maintained first position on his M5 Carbon High Racer, almost overtaken by the pursuing group of road bikes. However, directly after passing the highest point Herke plunged down the mountain again, leaving all other rider effectively behind. During the last, relatively flat part nobody managed to come even close to Herke and victory was sure. Picture: Herke returns after the race to the accommodation of the M5 Team.